Since they first appeared in New York City, bagels have become a staple of American breakfast lovers everywhere. Maryland is no exception, with some of the finest bagels shops in the country and some amazing diners and delis serving up this delicious breakfast food all day long. Stop by, spread some cream cheese, and raise a toast with a hot cup of joe. Here are Maryland’s best bagels shops. Bagels and…! The name says it all about this family owned bagel shop that has become a mainstay for anyone seeking a bagel in Annapolis. In addition to a wide assortment of bagels, they have over 20 different ty pes available at any time, they also serve a variety of sandwiches, center cut nova, salads, and deli style meats. The accolades aren’t just local, as this hot spot has been named a best bagels spot by Washington Magazine for seven years in a row. Annapolis is a navy town, you cannot miss it. Which is one of the reasons why Naval Bagels has become such a popular spot for people to get their morning’s started right. Nine years after they opened the first store in Annapolis, the partners who brought bagels to Annapolis opened a second location in Arnold. The bagels are made the old-fashioned way, boiled and then baked. If you’re in the mood for lunch, stop by one of the locations and try out their bestselling lunch sandwich, the Avocado Delight. Bagels and Grinds takes bagel making to a whole different level with a proprietary bagel making formula that leaves their bagels crispy and crunchy on the outside, while they are soft and chewy on the inside. For anyone in Anne Arundel county, that happens to be around Arundel Mills this is the place you want to go to get some of the most delicious bagels you have ever tasted. The Roland Park Bagel Company is one of the best places to stop by for a delicious bagel, and a cup of perfect Quartermaine free trade coffee. The bagels are made on site, and offered in 13 different flavors throughout the day, for customers in Baltimore. If you are craving something a little spicy, try the jalapeno bagel, or if you want something to meet your chocolate craving, try the chocolate chip bagel. This is a place that you can come to experience the bagels that the Baltimore Sun called the cities best in 2009. Goldberg’s New York Bagels have a long heritage and history. Their modern, state-of-the-art store in Baltimore may look modern but the bagels patrons enjoy there come straight from the recipes of a polish immigrant, and one of the founders of New York’s famous bagel industry. Crafted with the finest ingredients, and naturally boiled before baking, this powerhouse is not only a local favorite but also ships their bagels all over the country. 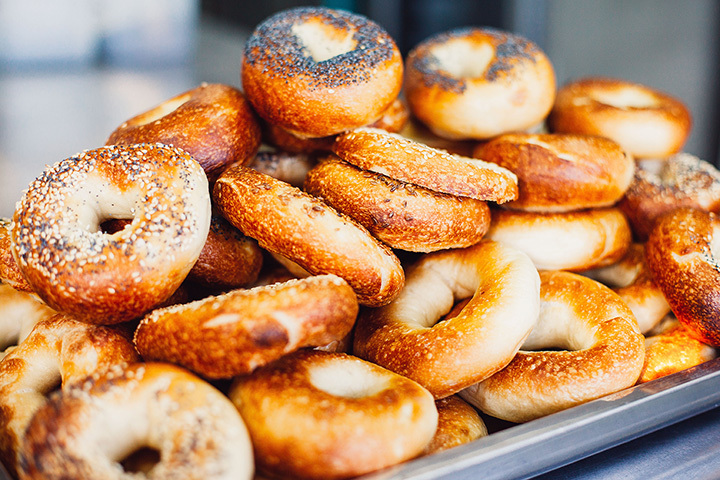 If you truly want to experience the mouthwatering flavor of bagels that have been passed down generation to generation, come in to Goldberg’s New York Bagels and take a very Maryland bite of the Big Apple. THB in Canton is a family owned bagel shop that started out with humble beginnings, only a few seats and the freshest ingredients. The concept of a family-owned, freshly-baked bagel shop caught on quickly and now locals in three locations flock to THB to get their morning delight. For people who want to get breakfast on a bagel, instead of just a breakfast bagel, stop by one of the locations and try their spectacular egg and cheese bagel, or the local favorite egg whites cheese and tomato on a bagel to get a wholesome start to your day. If you want to have your bagel in one of the most nostalgic atmospheres around, stop by Double T diner in Annapolis, and get your fill of this 60s-style diner. The bagels are great, served with butter and jelly or cream cheese. If you want to try something different, order a bagel toasted with lox, cream cheese, onions and garnish. The pastry section at this iconic restaurant is to die for, and their breakfast menu will have you coming back over and over again. Bagel Place of College Park is the place to be if you are a student of the University of Maryland College Park and want to grab a quick bite for breakfast or lunch. Established in 1983, this family owned and operated bagel shop has been catering to young crowds, and drawing in late night studiers for their famous espresso bar. Themed with Maryland Terps memorabilia Bagel Place of College Park is almost always buzzing with locals, students, sports teams and coaches, and yes, the odd famous person or two. Come in for the atmosphere and try one of their hearty everything bagels or if you want something a little more unique the pumpernickel bagel has quite a following. Located in North Baltimore’s hottest gathering spot, Belvedere Square, Greg’s is one of those quiet and unassuming shops that simply provide people with what they are looking for—the best bagels that can be found in the local area. If you are looking for great friendly service, a delightful cup of joe to start the morning off right, and bagels that have been continuously voted “Baltimore’s Best,” then go in and get your bagel at Greg’s Bagels. Greg and his staff are always quick with a smile and their bagels are fantastic, which is one of the many reasons it’s a great local haunt. Ellicott City is booming, and so is business at Bagel Bin and Deli. Located in the Enchanted Forest shopping center they are making a name for themselves with specialty coffees and bagels that have the locals, and out of town visitors, buzzing. Whether it is a BLT bagel, or a roasted beef bagel, patrons just cannot get enough of these specialty bagels that are made to order. If you like meat, try the triple meat bagel, and make sure to get a cup of their specialty house blend coffee to complete the perfect breakfast.